Even 140 years after Albert Einstein’s birth, his scientific discoveries still impact our lives–lasers, nuclear power, fiber optics, driverless cars, GPS and space travel all trace back to Einstein’s theories. Today, the Hebrew University of Jerusalem (HU) unveiled 110 new manuscript pages, most of which have not been displayed before, and which shed light on the scientist and the man behind the science. Einstein was one of the founding fathers of the Hebrew University of Jerusalem (HU). To him, the University represented a combined commitment to a Jewish identity, the pursuit of truth, and respect for all human beings. For these reasons, Einstein bequeathed his personal and scientific writings to the university and the Albert Einstein Archives were born. As the Archives’ Academic Director Professor Hanoch Gutfreund shared, “We at the Hebrew University are proud to serve as the eternal home for Albert Einstein’s intellectual legacy, as was his wish”. • 84 sheets, most of them mathematical derivations from 1944-48. Here, Einstein’s research notes give us a direct, unedited insight into the workings of one of the most creative minds in the history of science. While the scientific context of many of these calculations is not yet clear, an initial description was provided by Prof. Tilman Sauer at the University of Mainz. • A handwritten, unpublished appendix to a scientific article on the Unified Theory that Einstein submitted to the Prussian Academy of Science in 1930. This article was one of many in Einstein’s attempts to unify the forces of nature into one, single theory and he devoted the last thirty years of his life to this effort. This appendix–Page 3—has never before been seen or studied and was thought lost until now. • 4 letters from Einstein to his life-long friend and fellow scientist, Michele Besso. Three of the 1916 letters refer to Einstein’s monumental work, based on a “glorious idea”, on the absorption and emission of light by atoms. This idea later became the basis for laser technology. In the fourth letter, Einstein confesses that after 50 years of thinking about it, he still does not understand the quantum nature of light. • The letters to Besso also contain Einstein’s witty and personal remarks about family matters and Jewish identity. 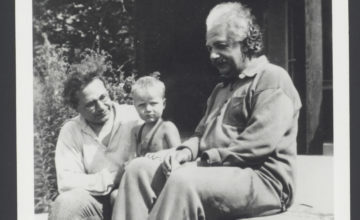 In one, Einstein teases Besso for having converted to Christianity, “You will certainly not go to hell, even if you had yourself baptized.” Though Einstein is impressed that Besso is learning Hebrew and shared, “As a goy, you are not obliged to learn the language of our fathers, whilst I as a ‘Jewish saint’ must feel ashamed at the fact that I know next to nothing of it. But I prefer to feel ashamed than to learn it”. Einstein’s cousin Karen Cortell Riesman flew in from Texas to attend the arrival of the new manuscripts. She shared personal experiences of growing up in a house imbibed by the famous cousin. “Whenever someone came to visit our home, we always showed them our ‘Einstein Wall’ which was full of photos and letters from my grandmother’s famous cousin.” Cortell Reisman recalled. Cortell Riesman’s grandmother, Lina Kocherthaler, was Einstein’s relative. The two often traveled together and remained in close contact throughout their lives, sharing decades’ worth of correspondence. “Later, when I got married, instead of a Tiffany bowl or crystal vase, I asked my family for a gift that would be much more meaningful to me: a July 1949 letter that Einstein, along with my father and mother, wrote to Lina,” Cortell Reisman shared. These days, Cortell Reisman delivers keynote lectures titled “Letters from Einstein” in which she shares with individuals and businesses how to apply Einstein’s principles to increase creativity in their own personal and professional lives. The new manuscripts were acquired for HU’s Albert Einstein Archives thanks to a philanthropic gift by the Crown-Goodman Family Foundation in Chicago. They were purchased from a private collector in Chapel Hill, North Carolina. Following the preservation and digitization of these new documents, HU’s Einstein Archives is currently working with Caltech’s Prof. Diana Kormos-Buchwald of the Einstein Papers Project to decipher the scientific and mathematical contexts for many of the calculations in this new collection. To date, Hebrew University’s Albert Einstein Archives contains more than 80,000 items, including manuscripts, correspondences, photographs, diplomas and medals. These items make accessible to the public not only Einstein’s scientific achievements but his public activity and private life, as well.